He hoisted the Indian national Flag,undeservedly,as he had insulted India’s national Anthem at least once.Made deceptive speeches,as usual . August-September,2011:-Declares a net asset of Rs 5 crores[ONLY]! On a visit to Bangla Desh,mainly for “Economic Integration”,reportedly.That is the beginning of a Union like the EU which started as a Monetary one,with the ultimate aim of One World Totalitarian Government,which will result in India losing her Sovereignty.As usual he is under the orders from his master. Another is the border adjustment in which India is to,lose a few acres of land[as usual].India had earlier lost land to China and Pakistan. BJP may not agree to this loss of about 10000 Acres of land. BJP wants discussion on the Parliament and placing of the relevant information in Public Domain regarding the “adverse” Land agreement by the MM Singh with Bangla Desh,in which the Indian Citizens at large have been kept in the dark and which looks anti-National. Has since arrived in Bangla Desh.The proposed removal of restrictions to travel by road to Nepal via Bangla Desh is THE FIRST STEP,for One World Totalitarian Government obliterating borders and making India lose her Sovereignty: a necessary step to achieve the aims of his Master. Returned due to blast in Delhi HC. Is an apologist for the faults of Minorities. Will be attending the UN Session shortly[leaving India on 21/9/2011]. In New York to attend the UN general Assembly.A total 9 Ministers and 2 Bureaucrats are in the USA at the moment.Pranab Mukherjee to fly in from Washington to New York to meet MM Singh to defuse the crisis regarding P.Chidambaram and his role in the 2 G Spectrum scam. MM Singh involved in the 2 G Spectrum scam from 2006.
i.MM Singh is indifferent to the demands of Shri Tapan Sen,for an enquiry in the scam of RIL/KG basin in which the latter was vindicated by the CAG Report on the same. MM Singh seems to be involved in the same. ii.Afghanistan president Karzai visits India and signs three agreements. The use of the phrase, ” Economic Integration” instead of ” Economic Cooperation”,in the article,sends shivers down the spines of those concerned about India retaining her Sovereignty,under MM Singh.Recall MM Singh is a Globalist,member,Club Of Rome.Gloablists work for making “their” Nations LOSE Sovereignty. Visited South Africa for the IBSA meet and Bali,for ASEAN and Asia Pacific Economic Countries[APEC]Meet,and Singapore for bilateral relations Business, etc.Obama seems to have bullied him.The result:-By November,25th FDI in retail[100% in Single brand and 51% in Multibrand],passed by the Cabinet[to favour Wal-Mart and Carrefour], but has met with strong Opposition in the Parliament, with even TNC of Mamata Bannerjee opposing though, it may NOT be sincere.Since this is in Concurrent List,States are NOT compelled to adhere to the proposed FDI by MM Singh. Visited Manipur with the Italian Woman.Was greeted with a bandh and a bomb blast which killed at least one in Imphal. Shown his place by NAKED MEN contemptuously holding Black Flag against him. Back from Russia.Signs 5 Agreements. An inter-governmental agreement (protocol) that envisages the manufacture[ Joint production and technical assistance]by Hindustan Aeronautics Limited of an additional 42 Su-30 MKI aircraft.Use of Fly Ash in Siberia,including two protocols, two memoranda of understanding and one pact related to exchange in education. 1.In Tamil Nadu for Mullaiperiyar and Kudamkulam issues. 2.22 die in Pulicat[near Chennai],as boat capsizes. Recently MM Singh has been cleared by the SC,in the 2 G spectrum scam which has been condemned by almost the whole nation. MM Singh’s attempt to impose 100% FDI in retail failed as many parties are against the same.PMP[his Office] is reported to have been LOBBIED[BRIBED} for rs 52 Crores by Wal-Mart and for rs 1 Crore by Starbucks,which was successful in its efforts at an entry into India,in single brand retail.Soon it has at least two JVs with Tata Group. China has again infiltrated into India recently as per the Indian Army.But MM Singh maintains,that the top to Chinese leaders,are his”friends”. The EU Trade representatives, led Rompuy himself was here. Both M M Singh and he are NOT ELECTED by popular vote,but are deciding the fates of India and EU!Duty in import of luxury cars,from EU, has been reduced. India’s,Trade Deficit will increase as the correct policy is to INCREASE Tax [duty] on imported LUXURY items. But the joke and pity,are that the RBI recently recommended “Diesel Price Decontrol” for reducing Trade Deficit. In short,a Conspiracy is on to introduce Free Market in India,to enable the MNCs[Globalist Oligarchs] to profit exploiting India’s cheap labour and resources like Water,Power,Minerals etc,but also penalizing our nation for Carbon Emission also. India is in very great DANGER,as each second passes with M M Singh as the Prime Minister. M M Singh has extended the term of Dr Subba Rao,Governor of the RBI for a further 2 years.Subba Rao of RBI is in Mexico to attend the G-20 meeting regarding Eurozone’s Debt and contribution to IMF’s Fund.It is noteworthy that the Eurozone except perhaps Germany has been bankrupted by the theft of national Wealth,by the misuse of the fraudulent Derivatives.Any contribution by India,to the IMF’s efforts, will be foolish as it is equivalent to allowing looting of India’s National Wealth. MM Singh has claimed that some NGOs were responsible for the moratorium on Bt Brinjal…Perhaps he is unaware that most of the States and people are against the GMO.Clearly,he is under pressure to allow entry to the US and other MNC GMO Cos into India.Earlier, he had claimed that the Koodankulam protests against the Nuclear Plant there,were on the instigation of US and Swedish,NGOs for which he may be sued by the protestors. MM Singh’s LIES are becoming more and more frequent and it may concluded, he LIES and works secretly,against the interest of India,on the diktats of his masters from the West. In Seoul,South Korea for the so-called,”Nuclear Security[?],Meet. Is asking the South Koreans to invest in India’s infrastructure.Defence co-operation to be raised,India’s Military Attache will be stationed in Seoul[unnecessary and dangerous for India]. Is a strong suspect in a Coal Block allotment scam from 2004,when he was in charge of the Coal Ministry,worth “some” Lakhs Of crores of Rupees! Goldman Sachs delegation meets MM Singh. MM Singh to meet Sardari, Pakistani President,in SECRET. 3.For converting SAARC into a EU-clone,MISUSING Trade,for ushering in One World Totalitarian Government,of the Globalists,of which MM Singh is one,being,member,Club Of Rome,of which Gorbachev,who “dissolved” the erstwhile USSR was also one.India will LOSE her Sovereignty,in such a case. 1.Pakistani Parliament[Congress?] wants many concessions from the USA. 2.The so-called,”interlocutors” for Kashmir “submit” their report,to the UPA. 3.Zardari comes an hour late to meet M M Singh and raises the Kashmir question! 4.Some concessions offered by the UPA to Pakistani prisoners in india. 5.The USA and China express happiness over the development! 6. Gujarat Ode verdict announced when Zardari was present in India! The question is:-Has a SECRET deal,regarding Kashmir,reached?It is worth noting that MM Singh,a Globalist[anti-India],member,Club Of Rome,former employee of the IMF and the World Bank,works in SECRET,a trade-mark of the above two bankers and the USA! Now it transpires that a secret transfer of Siachen to Pakistan is contemplated by M M Singh and he is getting the Army general changed for the same. Inaugurated the Bhatinda Refinery of HPCL,on a PPP basis with Mittal.He,UNFAIRLY,claimed the Petroleum-based Fuel prices have to be raised.he further said that it will be done by insulating the “common man”. In Mexico for G-20 meeting.In Rio for Rio Meeting[UN sponsored].This meeting, is 20 years after the first one,in Rio itself.UN[USA,NATO,Israel],trying for One World Totalitarian government. M M Singh uses the tactics of his masters the World bank and the IMF,namely,pretending to help the poor but actually act against them in favour of the rich Oligarchs and MNCs. In the initial stages, of his premiership,M M Singh was very contemptuous of the poor,Labourers etc.but lack political strength has changed him outwardly,but in his heart of hearts he is ONLY for the rich Oligarchs and the MNCs,acting against India,as he is a Globalist,member,Club Of Rome. In Pretoria as on 23/6/2012. Visited Assam,along with the Italian Woman, and inspected the damages due to the recent floods,in which 77 lost their lives and more than 2 Lakhs were adversely affected.Announced Rs 500 Crores relief package. i)Tax-payers’ money is transferred to the Indian and Foreign oligarchs. ii)India’s wealth in terms of land etc will be transferred to the two mentioned above. M M Singh has been doing this from the 1990s,with the Gold Swap in which seems to have been subjected to the “Diomedean Swap” and to be on the losing side. India seems to have got Tungsten plated with Gold,for her PURE GOLD.The Gold-Tungsten Scam has been going from the 1980s. The “Gold” that IMF sold India in 2008,is reported to be,Tungsten plated with Gold,on the net. BJP is demanding M M Singh’s resignation due to his involvement in CoalGate.M M Singh promptly ran away[as usual],to Iran to attend NAM[! ].And,again as usual,started preaching from HIGH ABOVE SKY,in the Aircraft! Tracking M M Singh will be easy with his own website. True to his nature,M M Singh seems to have stabbed India in the back,yet again. At the same time the 21st ASEAN Summit was also going on in the same place. Obama has come for the TRANS-PACIFIC PARTNERSHIP. 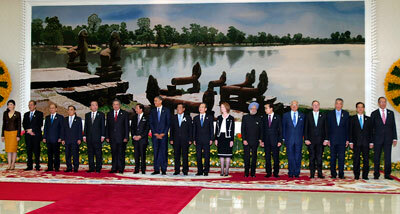 Gillard was also there.M M Singh was photographed along wth these two,possibly in the TPP. THUS INDIA SEEMS HAVE BECOME A MEMBER OF TPP,BY STEALTH. Addressed the UNGA,Claimed that Peace,Terror etc are secondary to “ROBUST GROWTH”,for “removing poverty”.This is one of his favourite double-speaks! on 20/10/2013,started his visit of China and Russia. Special Court makes M M Singh an accused in Coalgate and asks him to appear on 28/4/2015,before the Court. SC dismisses the order and offers M M Singh relief. It is a mystery and a shame that we Indians followed blindly and became slaves to the British “ Westminster ” model parliamentary system since 1947. The tunnel-visioned Jawaharlal Nehru a proven Anglophile wore kathar or handloom and spoke in Hindi to impress the gullible masses but communicated to his close circle in English. It is time to throw away this Westminster model and formulate our own system of governance. Get rid of the outdated colonial mindset, pantheons and establishments such as the IAS, IPS, IFS and IRS as soon as possible. These colonial establishments had enabled mass corruption and created poverty and misery to many millions. It had benefited a privileged few such as the criminal syndicate, the Zionist Rothschilds followers and representatives in the Congress Party. M.M.Singh the paid coolie of the House of Western suckers led by barmiad Sonia will eventually destroy Mother India and her citizenry. High time to start a “Second liberation” against the Rothschild suckers in Bharat Mata. Sooner the better. Stop watching Hollywood and its imitation Bollywood junkies. Jai Hind. M.M.Singh and his gangster pal Monteik Singh Ahluwalia are Rothschild’s agents. These two criminals are destroying Indian Economy at supersonic speed. They are the paid servants of the City of London criminals led by Rothschilds and the Wall Street goons led by GS. It is time for the public of India to remind them of what happened to IL Duce in Italy. These two criminals have to face justice soon.